and Join The Saint Circle . . .
Join the Circle! We would love to hear from you! It's FREE, It's EASY, No SIGN-UP, just e-mail us. 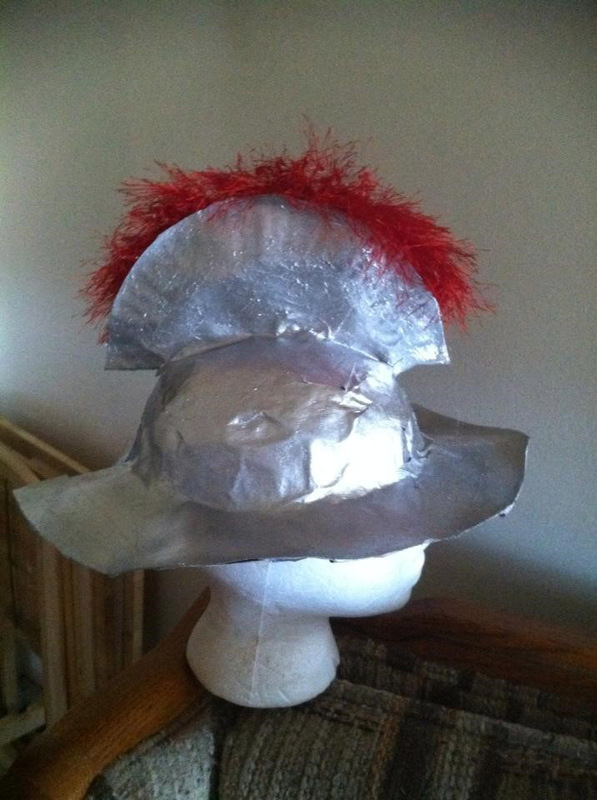 I had trouble with the balloon, so I found an old wig head, wrapped it with saran wrap, taped the brim & top piece, then molded the paper mache. cardboard appliance (dishwasher size works) boxes that we spray painted white and used white duck tape to tape the 3 boxes together. Used the gray tape on the inside of boxes. Then used a red plastic tablecloth to "line the back" and stool for pictures. Kids enjoyed that. we used a dome-shaped tent and simply put it on the floor. We covered it with burlap fabric, but we wouldn't have had to do that. The lessons were taught sitting outside the tent because our "Jerome" player was an older man who didn't want to be crawling in and out. The kids did get to go in, however. Art studio: used fabric on the floor that looked like canvas, easels with "paint-splattered" backgrounds, a large "palette" and other art supplies were "laying around"
Attached is the information on the 3d puzzle I ordered. Also I have attached some of my decorating ideas. School bus picture frame. Idea came while watching the kids load up on the bus for their Vatican tour. Print School Bus pattern found HERE at the bottom of the document. Cut out the outline before you glue the tissue paper. Cut tissue paper into 2" squares. Crumple each piece into a tight ball. Dip into white glue and place onto pattern. Start with the small sections first to make sure they keep their definition. Continue crumpling and gluing down pieces until the entire pattern is filled. Tape photos to the back of the school bus showing happy faces out of the school bus windows. St. Mary's in Tulsa is using white butcher paper to make 6' columns of the vatican then printing the staues of the apostles to put on top of the columns. This will help decorate our big gym. All stations including registration area can be decorated with the Vatican Theme. Vatican Express Clip Art Images: Utilize Free Pass Clip Art/Resource CD: The Coat of Arms of the Holy See. Print it out from the TIFF file and project it on the wall to trace and color or take the EPS image to a printer and to print a poster or a huge banner from it to hang in the Assembly Area. Bus Stop Signs for all Leader Areas are included. Use these on the doorways of all section areas to go along with the Vatican Tour Theme and for easy identification. Daily Theme symbols which have the Papal Crown, The Keys, The Basilica, The Chalice and The Monstrance respectively can be printed or enlarged and hung on the walls art gallery style. (Inexpensive tip: Print image from CD, project it on the wall to enlarge onto bulletin board paper. Trace and color.) Make gold spray painted cardboard frames for them and hang them on the wall like an art or treasure museum. Take 4 yards of brown fabric. Fold in half end to end. Cut a hole in the folded edge for the head. Tie a rope around the waist and blouse the excess fabric up over the rope to adjust the length. Pin side below belt together. Add a pair of sandals and a brown hoodie shirt and brown tights underneath for a quick monk costume. Imagine a large Vatican Express Bus (Free Pass Clip Art CD) on the wall in the Registration Area. Make a Pope Mobile out of large cardboard boxes. (optional ) See Closing Assembly for other props and costumes needed. Make this area resemble an artist’s loft from long ago. Spare in furnishings and no fancy furniture. Make a fake garret window from a large piece of cardboard. Glue construction paper “glass panes” to it. Set a large easel in the corner with an old paint stained palette and some brushes on a table next to it. Find some pictures of Michelangelo’s paintings online, print out, enlarge and glue to cardboard. Use these as “canvasses in progress” stacked all around the room. Put a coat rack in the corner with a paint-spotted smock (an old lab coat is good for this) hanging on it and a beret. Cover the work tables with old canvas drop cloths. Dress up like Michelangelo with a beret, smock and tights. Try to make this area resemble St. Peters Square. Ask Youth Helpers to use bulletin board paper to draw and paint background scenery of large saint statues on the walls of the room. Build a mini-Obelisk out of cardboard or use a metal decorative one from a Garden Center .Place the Obelisk on a round table in the center of the room. Cover the table with a blue plastic circular tablecloth on it to resemble a fountain. Attach light blue and white streamers to the sides of the cloth to resemble water. Suspend colorful umbrellas from the ceiling over the food tables to give your area an “outdoor café” feel. Alternate red, yellow and blue plastic tablecloths on all of the tables. Put saint statues down the center of the tables in between food items. Don’t forget the pigeons! You could even dress like one! Try to make this area resemble a Palace Music Room. 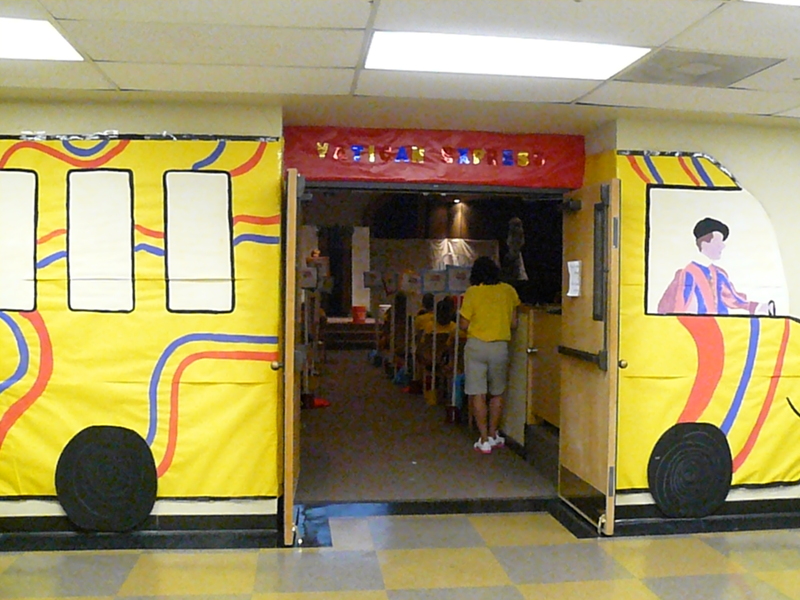 Put swags of red, gold and blue fabric on the walls and around the doorway (or use streamers). Make gold painted cardboard silhouettes of musical instruments and pin them to the fabric or tape them to the walls. Make a cardboard harp and put it in the corner. (or bring in real musical instruments if you have access to them -establish a no-touch policy) Find pictures of cherubs with instruments; enlarge and frame them with gold painted cardboard frames. Hang these on the walls. Make 2 large gold painted cardboard music notes and put one on each side of the door. Display saint statues in the corners of the room. Dress up like an angel and don’t forget your conductor baton! Divide areas, (Snack, Craft, Lesson, Activity, Music etc.) and decorate each one with a theme decorating scheme of each saint. The Craft area could be decorated like Christmas, or Wintertime for Saint Nicholas. The Storytelling and Lesson area could be decorated like Kateri's Indian Village with a faux campfire where the children could gather around to listen. The Snack area (since it is for nourishment) could be decorated like Martin's Clinic, an old-fashioned herbalist hut or something with dried fruits and herbs hanging everywhere. Or posters with different herbs and their uses. Or just decorate it with a nature theme. The Activity Area could have a Mexican decorating theme for Juan Diego, very bright, colorful and energetic. Decorate the Music area like Ireland for Brigid. From all of us at Growing with the Saints, Inc.
Another idea would be to play up the cultural diversity of the program by making separate paper doll forms of all different colors and sizes, tape them together and string them everywhere. Hang them from the ceiling, stick them on the windows. Make some giant people shapes for the different areas and make them super colorful. My point is, they could really play up the theme of different cultures working together to do good things. Decorate the different rooms in a single color of the rainbow. Tablecloths, balloons, ceiling drapes, swag banners, etc. Rooms can be referred to by their specific color. This idea was sent to us in the form of photographs from Dianne Brennan, St. Thomas More Church. All of the rooms were Beautiful! Have teens color the images on the daily take home pages, then have them enlarged as big as possible and decorate your rooms with them. We received this idea from Angie Harber, St. Vincent’s Catholic Church when she told us she had used all of our clip art and take home images for decorating.